La La Land. Surf, sand and suntans. As I parked under a palm tree outside Moira Conlon’s office, I was wondering how much someone from this mecca of the laid-back life could really tell me about the hard-nosed business benefits of thought leadership. But never underestimate Moira, or her hometown. 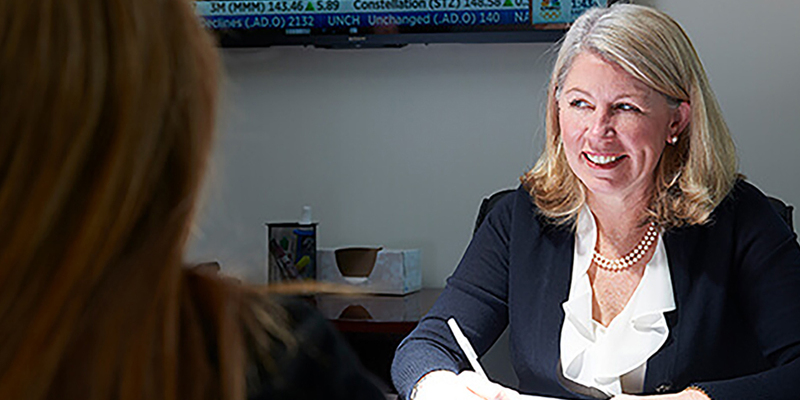 She’s the President of Financial Profiles, a communications consultancy that mixes investor relations with classic PR to do one thing above all: help create value. She’s done it for scores of companies across many sectors, guiding them as they “go public and grow public” (my expression; don’t blame her). So I was eager to interview her, to see if and how thought leadership helps create long-term business value – and I was not disappointed. Chuck Kent: As I’ve followed your work, there’s seems to be a common thread as to why and when clients come to you – namely, at moments that can either create, or fail to create, value. CK: I know you employ a whole suite of tools which might be categorized as classic investor relations or public relations – but how do you see thought leadership playing a role in your efforts and your clients’ successes? And I’m thinking of thought leadership as longer-term efforts that project a firm’s intellectual capital and are deployed to help an industry at large – but not anything that primarily promotes a company. MC: You make a very good point. It’s not about promoting the company directly. We talk to many clients, and often the CEO will say to us, “I really want to get a great media story on my company. We built a great organization here. Our whole team has worked so hard, and we have all these fantastic results. We need a story about our company.” But the issue now – one that we’re constantly explaining to our clients – is that it’s almost impossible to get a feature story like that these days. The best opportunities out there to promote your company aren’t through self-promotion – they’re through thought leadership, having opinions on where your industry is going, current trends, things that are happening in the news. The best opportunities out there to promote your company aren’t through self-promotion – they’re through thought leadership. CK: …because people are interested in them, and have a real need to figure them out. CK: The CEOs I know aren’t fond of giving away any sort of capital, intellectual or otherwise – so do you find that leadership “gets it,” that they understand the need to share the valuable insights they have? MC: Oh, I think so. I think smart CEOs absolutely know that. The one thing that companies don’t want to give up is competitive information, and we would never suggest that. We do, however, think sharing real thought leadership is critical. For example, we conduct quarterly earnings calls for our clients. If on such a call, a CEO, the CFO and the team do a great job of presenting data that’s very timely, that speaks to where the industry is, that shows what’s changing, what’s really going on and what’s ahead – those kinds of companies will do far better in engaging a Wall Street audience. After all, when investors and analysts get on an earnings call – and they’re tuning in to every earnings call of the 25 companies in the space that they cover – what they really want to find out is what everybody’s take is on this quarter’s big concern. We think sharing real thought leadership is critical. In almost every industry we work in, the landscape is constantly changing. This quarter it’s been all about tax reform. People what to know “How will that impact us?” We work with a lot of healthcare REITs, so let’s use that as an example. In that space, investors want to know about the moving target of healthcare legislation. What are you doing to get in position to respond to the changing times? How will new legislation or other forces impact the industry long term, and how are you getting in position to deal with that? CK: So make your insights useful, timely, topical… just not all about yourself. CK: You also deal with a lot with IPOs, and that certainly gets into constraints on communications, with quiet periods and whatnot. Does establishing yourself well ahead of time as a thought leader, as someone who is asked to comment as an expert versus just comment on the company – does that prove valuable once you hit a mandated quiet period? MC: Definitely. Even with quiet period regulations, if you’ve established a precedent of providing thought leadership – media interviews, speaking engagements, webinars, a broad range of things – you can continue to do those things throughout the quiet period. That’s one advantage of getting started early with thought leadership, but it’s kind of minor. If you’ve established a precedent of providing thought leadership…you can continue to do those things throughout the IPO quiet period. The real benefit is the value that gets created by investing in thought leadership and building awareness for the company, its brand, its products and technology well ahead of the IPO, so that all gets appreciated in the IPO pricing. That is really the big payback. CK: Something tells me that’s the ideal, but that it doesn’t always happen. MC: True enough. We work with companies that haven’t done a lot of thought leadership, but probably should have. Take the clean tech sector, where a lot of companies have tried to go public but failed. One reason is because they often have very complicated technology that needs to be “due-diligenced” and validated ahead of time. But out they go on an IPO roadshow and the investors say, ‘I can’t figure this out. I only have two weeks to decide if I’m in or out – so I’m out. Here’s where thought leadership in the pre-IPO period can be very, very helpful. It can educate investors on all aspects of the company, getting people to follow your company and making it easy for them to investigate all they need to know well in advance. CK: …so they’re almost pre-sold. Just one last question then. For the company or the leadership team that hasn’t really embarked on this thought leadership journey, what do you suggest as a starting point? MC: I think for every company it’s a little bit different, and it depends on how much time and effort they want to allocate to it – because it does take time and effort. A thought leadership program doesn’t result in overnight success, and so it’s something that you have to support consistently over a relatively long period of time to get results. You have to build your credibility and your awareness, for yourself and your company. So start by showing up periodically with thought leadership that’s relevant and helpful. In other words, you can’t just go to one conference a year and think that that’s going to do it. About the Author Chuck Kent, the Chief Conversation Officer at Lead the Conversation, works with executives to help them more easily create authentic, compelling thought leadership content – and to lead industry conversations. He is a writer, brand strategist, content creator and expert interviewer. Chuck is also a Contributing Editor for Branding Magazine, for which he created the monthly Branding Roundtable. Lead the Conversation provides a practical way to develop authentic thought leadership content for busy executives. We also help the C-Suite create and lead industry conversations, to which they can invite other leaders, turning prospects into relationships. © Creative on Call, Inc.